Two keys to successful trading are taking a business-like approach (complete with a business and trading plan) and effectively using available trading technology. The Trading Plan Development section of this tutorial introduces how to make a trading plan; in this section, we'll take a look at the various technology traders use. Not long ago, you would have had to pick up the phone and call your broker to place an order. The broker would have called the order in to a floor trader who was physically at the exchange. The floor broker would find a match for the trade, and by the time your order was filled, the price could have changed dramatically. Not that you would have known…you probably wouldn't have had access to a live data feed. Today, however, the technology that was once reserved for the exchanges and institutional traders is readily available to retail traders: Faster computers, all-electronic markets and direct-access trading have all helped level the playing field for the independent retail trader. Additional advancements such as trade automation, innovative market research tools, sophisticated testing platforms and apps have given traders even more technology to work with. To get started trading, you'll need a computer, a reliable high-speed Internet connection and trading software. A computer is your primary tool. This is where the action takes place and where you will research, test and trade your plan. In a perfect world, your trading computer would be used for one thing: trading. The reality, however, is that most computers have various applications running and are used for things like gaming and Internet surfing. That said, if you must use your trading computer for pursuits beyond trading, be sure it is adequately protected with anti-virus software. Many companies offer free or trial versions of their virus protection software (keep in mind, though, that free versions don't always run scans automatically). Regardless of the software that you select, the key is to install it, update it often and perform regular scans to keep your computer healthy. Your computer should have the fastest processor and the maximum amount of memory that you can reasonably afford (the shorter-term your style of trading, the more important this becomes). If at all possible, your computer should be capable of supporting multiple monitors. Trading with two (or more) monitors gives you the “real estate” you need to view multiple markets and trading charts, while having a dedicated order entry window. This can improve your situational awareness and allow for more precision in your trading. You should also have a phone that works even if you lose power – such as a fully charged cell phone. That way, you'll be able to call in an order to your broker if you've lost power. Keep your broker’s trading desk phone number in your contacts and have your account information handy. It's also a good idea to have a back-up battery for your computer – an uninterruptible power supply (UPS). Think about how long you would need to keep your computer and other essential equipment running to properly manage and/or close out trades in the event of a power loss, and shop for a UPS based on that criteria, as well as the number of inputs you will need. It's worth noting that, depending on the type of trading you're doing, you may be able to research, execute and manage trades from your mobile device or tablet. 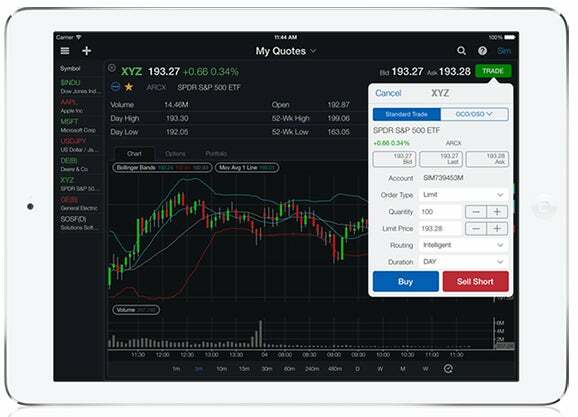 Most trading platforms today offer robust mobile interfaces, in addition to their web-based on downloadable software. Even if you don't make your mobile device your primary trading machine, it's a good idea to have your platform's mobile app loaded – just in case you need it while you're traveling or if your main computer crashes. The TradeStation mobile platform has advanced charting and order entry capabilities. In fast-moving markets, it's definitely to your advantage to have a fast, reliable Internet connection so your trade orders are submitted and filled as quickly as possible. While most retail traders can't complete with institutional traders in terms of execution speed, a lag time of just one or two seconds can still mean the difference between a winning and losing trade. Depending on where you live, you may be able to pay a higher rate to your Internet Service Provider (ISP) to get faster speeds. In general, if you're doing anything faster than position trading, it's worth the added expense to have a faster connection. The market analysis component of trading software is what allows you to view and customize price charts and display price quotes. Depending on your style of trading, you'll need end-of-day market analysis (with delayed quotes) or real-time quotes that instantly update as market conditions change. Longer-term traders (position and some swing traders) may be able to use the EOD data; shorter-term traders (some swing, and all day and scalp traders) will need access to real-time data. The next component is the software’s backtesting application. Not that many years ago, the ability to backtest at all was a fairly advanced feature of trading software. Today, however, traders can not only backtest, but also perform multivariable optimizations and walkforward optimizations/testing. These tools can greatly improve your ability to accurately test a trading system. Lastly, your trading software will have at least one order-entry interface. Some trading software offers very basic order entry, while others support advanced and even customizable interfaces. Many platforms support various levels of trade automation, from conditional orders to fully automated strategies. Many trading platforms – the software that provides the market analysis, testing and trade entry capabilities – provide a simulated environment where you can practice taking trades and try out trading ideas. These “sim” accounts provide valuable experience for new traders, but it's important to remember that sim trading and live trading are different animals. Sim trading, for example, often generates order fills that would never happen in live trading (giving you a false sense of profitability in many cases), and the emotions involved in sim trading can never be relied upon to represent how you will feel and act in live trading. That said, sim trading is an excellent way for traders to gain experience in the markets and with actual order-entry placement. While some trading software is sold as a complete package, most is leased on a monthly basis (from your broker, for example). In some cases, the monthly fee is waived if you trade a specific volume (e.g., 10 round-trip trades per month). It is important to note that in addition to any software/platform fees, you may also have to pay for certain data feeds, such as quotes from specific exchanges. These fees differ depending on your status as a trader: in general, the fees are relatively low for individual traders, but can be quite high if you are considered a “professional” trader. Do they provide their own order-execution software and is there a platform fee? Do they service markets that you want to trade (i.e., stocks, futures or forex)? Do they support simulated trading? How do they handle order execution? What are their hold times when calling? What are their margin requirements? What type of data feed do they provide? Once you have decided on a broker, you will be able to open and, if desired, fund a trading account.